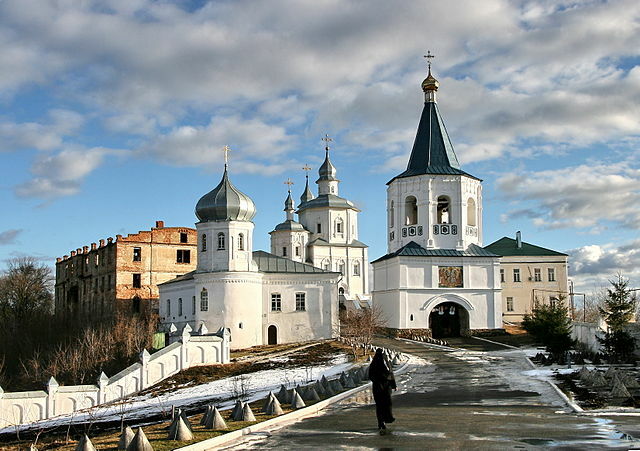 In the early hours of the morning of 14th November 1776 the nuns of the St Nicholas Holy Jordan Monastery in Kiev were woken by the sound of a struggle coming from the cell of one Sister Asklipiodata. Before long the assembled nuns saw Mother Superior Alexandra’s servant Joseph Tertichnik grappling with a loudly protesting Asklipiodata. Some of her friends hit the man with a stick, while others pulled her away. Eventually freed from his grasp, a dishevelled and bloodied Asklipiodata hurled insults at the mother superior. No inhabitant of the nearly one hundred nuns’ cells situated on the convent grounds could have been unaware of the disturbance. Mother Alexandra’s account of the fracas (submitted to the Metropolitan of Kiev) complained that Asklipiodata was frequently absent and often repulsively drunk. She was also accused of bringing assorted secular persons back to her cell at all hours, where noisy drinking parties were held. As if this was not enough, she also struck up an inappropriate relationship with the convent’s handyman Nedelshchenko. All she had received from the sister by way of an explanation, Mother Alexandra stated, was the defiant statement that without “meat and men . . . her dissolute nature could not do.” When Mother Alexandra was informed that the handyman was spending the night in Asklipiodata’s cell, she sent her servant Joseph to break up the company, reprimand the nun on the Mother’s behalf, and threaten her with imprisonment for the breach of discipline. In response, Asklipiodata attacked the manservant. This episode, detailed in a new article by Liudmyla Sharipova (see link), gives us an insight into the life of a convert nun (the rebellious sister had been born into the Jewish community in Prague in 1715) before the reformation of monastic practice in Ukraine in 1786. At the time of Sister Asklipiodata’s run-in with Mother Alexandra, monastic life in Ukraine (then a Hetmanate of the Russian Empire) was governed by local ecclesiastical officials. It was possible (and even required) for nuns to hold property in order to support their monastic life. Nuns were required to purchase their own “cells,” which could be stand-alone or semi-detached structures ranging from primitive huts to palatial houses within the monastery grounds. These could be sold and even inherited by next of kin. Strict discipline and communal living was only introduced into Ukrainian monasticism by the reforms of 1786 when all such institutions were put under the central control of the Holy Synod in St Petersburg. Until then, religious observance was the only truly communal aspect of the unreformed and non-communal (or idiorrythmic) convent. Hence, Asklipiodata’s independence was guaranteed by the fact that she was able to own her own property and more or less come and go as she pleased. In spite of this relative autonomy, Sister Asklipiodata was a restless presence in the convent, perhaps discontented by the increasingly strict discipline of Mother Alexandra and the legacy of her own conversion. Although her monastic status was permanent and could not be renounced, she left the convent in December 1777 and little is heard of her after that. Nevertheless, her life gives us a unique insight into the life of a nun at this time, showing that private property and personal wealth served not only as a gateway to monastic profession and the acquisition of specific social privileges, but also gave sisters independent means to maintain themselves within convent walls as well as relative freedom of movement.